For the Kessler Family, Giving to The Straz Means Upholding Tradition – What Will My Gift Support? Siblings Bob, Larry and Susan Kessler follow a family tradition of supporting the Straz Center that started with their parents, Walter and Leonore. 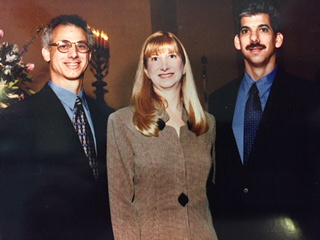 The sister-brothers team of Bob, Larry and Susan Kessler comes from a line of civic-minded people in Tampa that stretches back to the late 1800s. Their great-grandparents supported social causes and helped organize certain religious organizations that continue to thrive in Tampa to this day. With this example, their grandparents continued to involve Kesslers in social improvements and philanthropy, so when it came time to dig in and get a performing arts center off the ground in Tampa, Bob, Larry and Susan’s parents rolled up their sleeves and got to work. Walter and Leonore “Lee” Kessler, like their parents and grandparents, believed in community involvement as the path to community improvement. Both of them were founding donors to The Straz, and Lee actively participated in the founding campaign and other Straz events. Both Walter and Lee adored Broadway shows. From the very first Broadway show to the end of his life, Walter held multiple sets of season tickets so he and his loved ones would always have a seat at the great musicals. Lee, sadly, passed a few years after the opening of the Tampa Bay Performing Arts Center (TBPAC), to be named later the David A. Straz, Jr. Center for the Performing Arts. The Kessler crew enjoyed long years of dinner and a show at The Straz. Of course, life is about change, and the time would come when Walter would have to pass the traditions to his children. “As my father got older, and it became increasingly difficult for him to leave his home, he nevertheless made the extra effort to go to The Straz for the shows. It was something that he really looked forward to. As did we,” Susan recounts. We are thrilled to know we are a part of a family legacy, and we are especially pleased to know that Walter and Lee Kessler continue to be remembered and honored for their contributions to the cultural home for all people in the Tampa Bay region. Thank you, Bob, Larry and Susan, for everything you do to make the work of The Straz possible.